Schildcrout, Jordan. 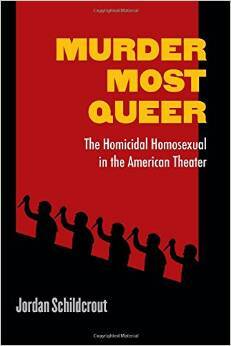 “Murder Most Queer: The Homicidal Homosexual in the American Theater” (Triangulations: Lesbian/Gay/Queer Theater/Drama/Performance), University of Michigan Press, 2014. It is not something we think about on a daily business but the homosexual as villain has long been part of the cultural imagination and it has prospered on the theatre. We find him in many dramas but we now see that as the way society sees the LGBT community today has changed and so has the importance and significance of the controversial characters. This is especially true when gay men play these roles. This new book examines the changing meanings of murderous LGBT characters in the American theater for the last century and now we see how “these representations wrestle with and ultimately subvert notions of queer villainy”. Jordan Schildcrout works to show the forces that create the homophobic paradigm that imagines sexual and gender nonconformity as dangerous and destructive. We also see how theater artists–and for the most part LGBT theater artists–have rewritten and/or radically altered the significance of the homicidal homosexual. These characters are far from being simple reiterations of a homophobic archetype and are complex and challenging characters that recreate “trenchant fantasies of empowerment, replacing the shame and stigma of the abject with the defiance and freedom of the outlaw, giving voice to rage and resistance”. These bold characters also explore the darker anxieties and fears that can affect queer lives and relationships. Rather than having them incarcerated or showing them as negative representations, the book looks at and analyzes the meanings in the murders that they commit and the confrontation of fears and desires that are part of the roles that they play. This entry was posted in GLBT non-fiction on November 24, 2014 by Amos.